Indoor skydiving is the act of flying your body on a column of wind in a vertical wind tunnel. It is a safe and fun experience for all ages. Improvements in technology are making flying even more accessible and enjoyable. Currently, there are over 60 wind tunnels across the globe, with over 35 new facilities opening in the next two years. Millions of people have already enjoyed a human flight experience. After reading this guide, you will be prepared to join them! The beauty of indoor skydiving is being able to have a flight experience just like normal skydiving, without the commitment. Instead of jumping from an airplane you simply lean forward into the wind from a door on the side of the flight chamber and immediately begin to fly. Every single flyer is given hands on instruction, the necessary equipment, and constant assistance from a qualified and rated instructor. The instructor's main priority is to provide a fun and safe flight experience. A controller operates the wind tunnel, making sure the wind speed is appropriate for each flyer. Unlike an amusement park ride, YOU are in control when flying in the wind tunnel. Your instructor will work with you throughout your flight, showing you how to control your body in the wind. In the end, this will provide you with an intellectual, skill based experience which is not only extremely fun but also challenging and rewarding. Commonly the age limit is 3 and up with an upper weight limit in the 250 lbs/114 kg range. If you have a previous shoulder dislocation, it is recommended that you do not fly. If you have a physical or mental disability of some sort, be sure to openly discuss this when booking your flight. The restrictions are there for your safety, and should be respected if you wish to have a safe flight. Educate yourself with the safety restrictions at your local wind tunnel prior to booking. If you want to capture lasting memories of your flight, most tunnels offer photos and videos as either part of their packages or as extras. Most tunnels also provide an observation area where an outside photographer or videographer can capture photos and videos of your flight. Until recently a high flight was normally an included part of the first time flight experience. Recently the wind tunnel companies have began charging an extra fee to do what is commonly referred to as "the best part" of the first time flight experience. For another $10 or so, a high flight is a must add 'extra' that you should strongly consider. When your instructor is working with you, teaching you to fly, you will hover in a safe range where they can work with you. Normally between 6 inches to 7 feet off the net. A high flight is when your instructor, holding you from the side, will use his skills to safely give you a higher flight experience than normal. When booking your flight, check to see if this is included in the flight package, often times it is not advertised up front. Please see our What is a High Flight article for an in-depth explanation. Booking a flight is as easy as calling or using an online system to schedule your flight. Normally wind tunnels are busy and time should be scheduled in advance. It is possible to show up and fly, but it is always best to call ahead. One common reaction is that a small amount of time (usually between 2 and 4 minutes) seems expensive. Without any reference this might seem to be true. When you compare tunnel flying to a normal tandem skydive you can begin to see the difference. A tandem jump is roughly $200 and the freefall lasts between 45-60 seconds. For much less than that you can experience double, triple or more flight time in a wind tunnel. Ask someone who just flew if the money was worth it, and you will find a resounding "Yes!" Please see our article on The Cost of Flying in a Wind Tunnel for full information on what to expect. When you arrive on the day of your flight you will go through a check-in process and more than likely observe for a short period of time before your class begins. Observing allows you to get a better idea of how the process works. The classroom portion prepares you for your flight experience. Your instructor will go over the communication process and how the flow of the class will go. Afterwards, you will get geared up with the provided flight suits, helmets, goggles and earplugs before you fly. Flying is a truly exciting and unique experience that is best enjoyed more than once. If you follow your instructor's guidance, you will be surprised by how quickly you begin to fly! How to Plan the Perfect Indoor Skydiving Birthday Party! 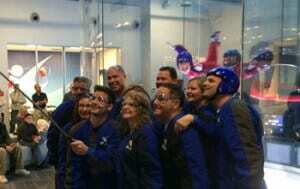 How Much is Indoor Skydiving? Strongly advised to Fly before first skydive. Instructor and Manager at new Jax. location super helpful and pleasant. Looking forward to opening!